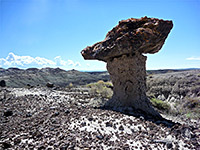 Ceja Pelon Mesa is one of the lesser badland regions of northwest New Mexico - areas of exposed, fossiliferous, sedimentary rocks, partially or totally unvegetated, containing a variety of eroded formations. 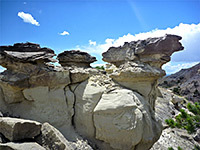 Bisti is by far the most well-known place, but although much smaller and having far fewer pinnacles and hoodoos, Ceja Pelon is more peaceful, with a greater range of plant life, and better long-distance views. Like adjacent Penistaja Mesa, this section of the state is very little visited, partly as it lies a relatively long way (13 miles) from a paved road, close to the easternmost edge of the Navajo Indian Reservation, in an otherwise uninhabited region. A small part of the hills just to the north is privately owned, part of a ranch, but all the badlands and cliffs are on public land and so also suitable for free primitive camping as well as cross-country hiking. The underlying rocks are a mix of sandstone, shale and siltstone from the Nacimiento Formation; black, grey, white, red or various shades of brown, forming some spires and hoodoos, but mostly just undulating hills, low cliffs and twisty ravines. 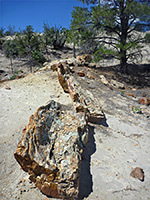 Like all the other badland regions in New Mexico, there is much petrified wood scattered over the slopes, here mainly yellow brown in color, and including sizeable trunks up to 30 feet long. Ceja Pelon lies just south of the continental divide, draining into the Rio Grande rather than the Colorado River, but it is still considered one of the San Juan Basin badlands. Map of badlands in the San Juan Basin. The mesa is 17 miles west of Cuba, reached by driving 9 miles along Hwy 197, 7.2 miles due west along a smooth, straight, dirt road, and finally 2.6 miles north on a narrower but still good quality track, as far as a junction on the west, from where Ceja Pelon is the escarpment visible in the distance, a mile or so northwest. The junction is also a good camp spot. From the junction, the westwards track crosses two sandy washes and ends a flat area centred on a metal pole and a 'Penistaja' sign, this being the site of a former settlement. The badlands start just ahead, over a low ridge, and extend for about 2 miles, all along the south edge of the mesa. 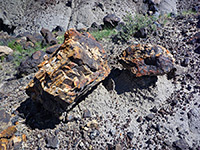 Exposed rocks are on three levels; the lowest is formed of black, grey and white mounds with scattered hoodoos, thin coal seams and fragmented pieces of petrified wood, while the middle layer is steeper, partly tree-covered, and contains the largest fossilised wood fragments, concentrated around the upper ends of the numerous little ravines that cut into the hillside. The top layer is flatter, and more overgrown, but has the most colorful sandstone, in rich shades of yellow and brown. 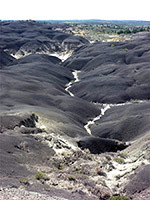 Occasional deep sinkholes are found in the black and white band, but generally cross-country walking is quite easy, as there are few steep parts. The most extensive section is the unvegetated mounds at the lower level, split by branched, winding washes, though without too much of specific interest. 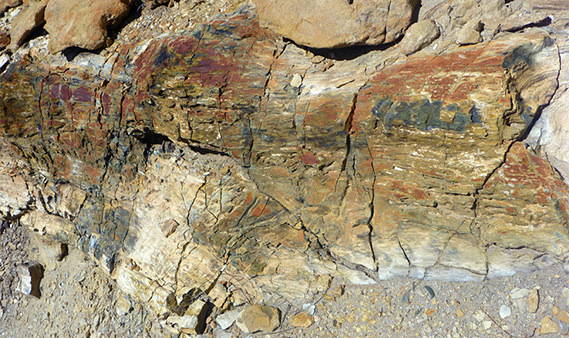 Hoodoos are also found along the middle level, together with more petrified wood including many recognisable trunk sections, some several feet across and many feet long, although they are usually broken into adjacent pieces. Parts of the wood are red and white, while most is yellow to brown. 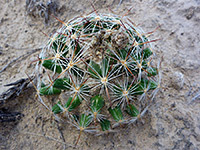 The mesa is home to a reasonable number of wildflower species, mostly in the bushy flats below the badlands, and several types of cacti including echinocereus, opuntia and coryphantha vivipara.